The MTA Is Selling Limited-Edition 'Game of Thrones' MetroCards. Here's How to Get Them. Winter is coming to the New York City subway system, and we’re not talking about extensive train delays -- though you can expect plenty of those, too. The MTA is releasing four limited edition Game of Thrones MetroCards, beginning Tuesday. 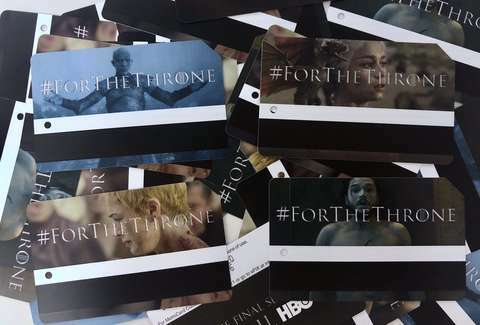 Each card will have a character from the beloved HBO series, returning for its final season in April 2019, printed on it as part of the series’ #forthethrone promotional campaign. HBO has selected the Seven Kingdoms’ incestuous power-couple, Jon Snow (Kit Harington) and Daenerys Targaryen (Emilia Clarke), to star in the campaign alongside evildoers Cersei Lannister (Lena Heady) and the Night King. The cards capture iconic moments featuring each character, including Cersei’s Walk of Atonement, Jon’s revival, The Night King’s Massacre of Hardhome, and the birth of Danerys’ dragons, so hopefully, you’re all caught up on the show. Like dragon eggs and Valyrian steel, Game of Thrones MetroCards will be scarce. For starters, they’re only available at fare machines in Grand Central Station, which will be plastered with more than 150 posters promoting the new season. What’s more, only 250,000 of the cards are being released. Given that more than 750,000 people pass through the dragon pit -- uh, transportation hub -- each day, you may just have a better chance at taking the Iron Throne than getting your hands on one of these MetroCards. Should you decide to go up against the white walkers, also known as your fellow commuters, to score one, you may just be rewarded for your efforts in the end. Limited edition MetroCards, like 2017’s Supreme collaboration or the recent David Bowie cards, sometimes make their way onto the resale market where they fetch way more than Subway fare. Just remember: “When you play the Game of Thrones, you win or you die.” Ok, it’s not that serious… but good luck.